Who'd have thought handwriting and Vista were so compatible? How often will you really use it? For most people a graphics tablet seems like an unnecessary luxury. The good ones are generally pricy and the cheap ones pretty useless. Unless you need to do a lot of design or image-editing work, you probably don't see the need. Bearing this in mind, why is Wacom aiming its Graphire 4 pen tablet at Vista users? The Graphire 4 isn't a new product, and although at £60 it's very reasonably priced, most users would probably struggle to come up with a reason for buying one. The clue, though, is in the word Vista. Whether or not you're a convert to Microsoft's new OS and despite some of its more obvious failings, there are actually some pretty good features buried beneath the skin. One such thing, which Microsoft has singly failed to draw any attention to whatsoever, is the Tablet PC input functionality. The pen is mightier than the mouse. While Tablet PCs themselves have been relatively unsuccessful, the handwriting technology is actually very good. While handwriting entries might seem a little counter-intuitive, unless you're an accomplished touch typist, hand-written input can be quite fast - especially on simple items such as the Vista search bar. 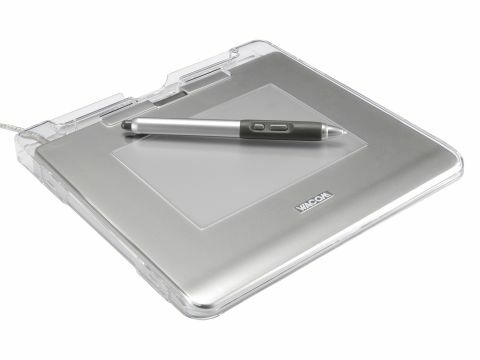 The tablet has an A6 working area, which is fine for small amounts of handwriting input and medium-level use in graphics applications. The plastic cover is removable to enable you to put a drawing or photo on top of the table area, so that you can trace outlines. When used with supported graphics software, the pen has 256 levels of pressure, and if you flip it over, you can use the end as an eraser. The tablet really comes into its own with Microsoft's OneNote application, which enables you to draw images and capture freehand text. However, this does mean further outlay. Still, if you want to try an alternative input to your keyboard, the Graphire 4 works well with Vista.